Refugee ship M / V Anton. 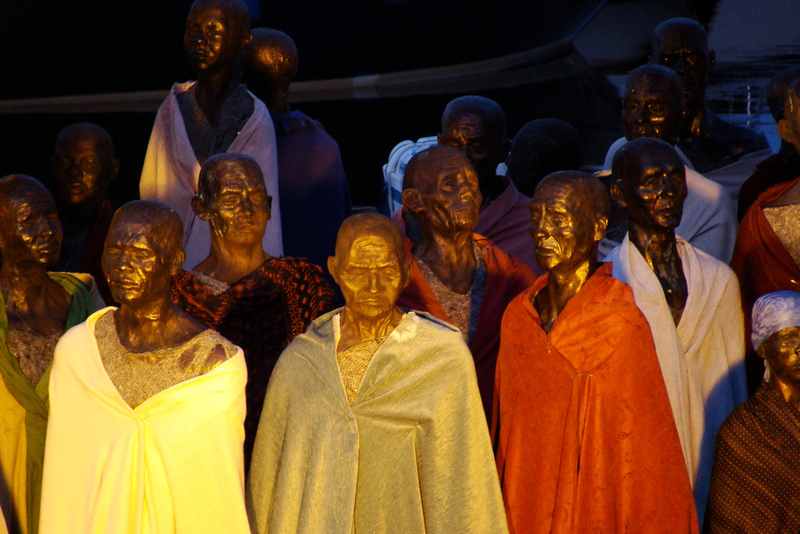 Anton's passengers are not living people, but lifelike bronze sculptures made by artist Jens Galschiot. Denmark’s refugee policy has turned out to be one of the toughest in the European Union. The country has one of the lowest asylum approval rates in the bloc, according to figures published by Eurostat. In the second quarter of 2017, only 26% of the applications were successful – down from 82% in the same period in 2016. As reported by The Copenhagen Post, only Bulgaria and the Czech Republic had lower figures, while the EU average was 46%, and Sweden and Germany both accepted 48%. Immigration Services said the low approval rating was caused by a high number of applications from Iranian, Afghan and stateless seekers. Officials expect the acceptance rate to increase again in 2018. Denmark’s far-right Dansk Folkeparti party, however, is pleased with the numbers. “The best part is that fewer are now seeking asylum in Denmark,” its immigration affairs spokesperson, Martin Henriksen, told altinget.dk. “It’s definitely moving in the right direction. Let’s now see if we can get the other parties to agree to tighten the legislation further,” said Henriksen.